As water becomes more of a scarce resource, effective management is required to maximise the benefits of your irrigation. Scottech has been dealing with soil moisture monitoring and irrigation management since the late 90's. These products can be installed as a stand alone datalogging system or incorporated in to an existing irrigation control system. We can offer products suitable for semi-permanent installation as well as portable equipment for taking spot measurements. The SoilVUETM10 is a soil water content profile sensor powered by Campbell TrueWaveTMTDR technology. A multiparameter smart soil moisture sensor combining soil moisture, temperature and conductivity. Our most popular Handheld soil moisture probe. 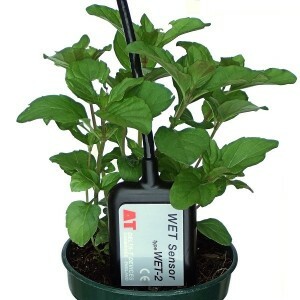 The WET-2 Sensor is one of few soil moisture sensors suitable for measuring moisture levels in alternative growing media used in the horticulture industry. The Theta Probe is well known as one of the most accurate and reliable soil moisture sensors on the market. The Model ML3 replaces the ML2x.